CMJ 2010 Report Part 7 of 10. This past Roctober, New York hosted its yearly CMJ (College Music Journal) Music Marathon. As the name indicates, The CMJ Music Marathon is a massive concentration of 100s of bands that descend on NYC like locusts and swarm every NYC venue over the course of a week leaving hangovers and ringing ears in their wake. There are those out there that like to believe that it is an indicator of the stylistic forces that will drive major musical themes for the coming years. The most notable bands caught at CMJ 2010 are: Savoir Adore, Alex Winston, Octant, Candy Claws, Kisses, Titus Andronicus, Holy Ghost!, Mathew Dear, Dean and Britta, Crocodiles, The Blow, and The Pains of Being Pure at Heart. Other bands caught were: Invisible Kid, Eklin, Samuel, Buke and Gass, Gold Panda, and a few others. We are in the thick of a 10 part CMJ series featuring the highlights of CMJ 2010 so check the archives and be sure to check back daily! The most memorable and lasting CMJ experience isn’t so much hearing or seeing the next big thing but rather stumbling on to something odd or really special. This year I got a tip from TSOI’s own Kevin to see Octant, a project of Matt Steinke of Satisfact/Mocket fame and more recently involved with the also excellent The 5 Cents (see TSOI archives). 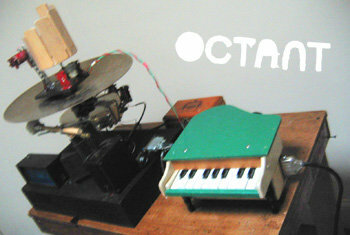 Octant is composed of Matt and his army of tiny robots that pick up keyboard and rhythm duties and act as his full band. Matt, clearly a mechanical/computer genius has programmed tiny instruments of carefully calibrated turning gears and pneumatically triggered percussion to create a totally automated but beautifully organic band. I can’t fathom how one could properly put into words the performance but it was unsuspectingly beautiful and oddly touching experience. How is it that the show comprised mostly of a robotic band provide far and away the most intimate show of CMJ 2010? It’s fantastic to hear an old Mocket track performed live again. Especially their best one (purely subjective).